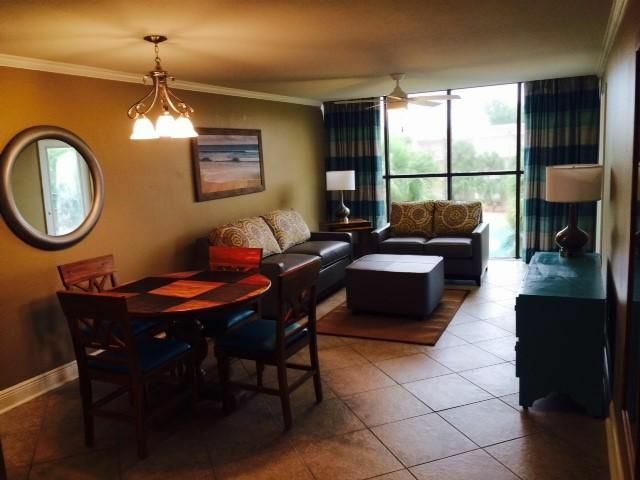 Ocean View Vacation Villas has the perfect location, just steps from the broad sandy Gulf beach and a short stroll to one of the area’s favorite casinos. Enjoy the pool, picnic in the resort’s pavilion and relax in your suite. Tonight, you may want to cruise Biloxi’s casino row, dine elegantly at Mary Mahoney’s or Anthony’s Steakhouse, or casually at the Fillin Station. Tomorrow it’s outlet shopping, fishing, an excursion to Ship Island or lounging on the beach. Each vacation condominium at Ocean View Vacation Villas accommodates 4 guests making them a perfect fit for two couples or a family seeking all the comforts of home. Spacious floor plans offer a large living area featuring Samsung Smart TV’s and Bose Sound Systems. Kitchens are fully equipped with stainless steel appliances, granite countertops, porcelain tile floors and dining room areas. Recharge yourself while enjoying a hot cup of coffee with our “Los Monentos de Vida” brand coffee, exclusively designed for Capital Resorts. Master bedrooms have private baths with oversized garden tubs, separate walk-in showers, double vanities and walk in closets. Our bathrooms feature Italian bathroom amenities by Pogessi and include high-pressure, eco-friendly showerheads by Oxygenics. Guest bedrooms also offer a private bath while French doors open from both bedrooms to a private patio or balcony. Stackable washer/dryers, cable television, complimentary Wi-Fi and hair dryers complete the list of creature comforts. All linens are provided. This approximately 1,217 square foot condo features two bedrooms, each with their own private bath and balcony, a fully equipped kitchen, living/dining room, and stackable washer/dryer. Located in the center of Biloxi’s famous Beach Boulevard, Ocean View Vacation Villas has the perfect location just steps from the broad sandy Gulf beach and a short stroll to one of the area’s favorite casinos. Enjoy the pool, picnic in the resort’s pavilion and relax in one of the generously sized two-bedroom, two-bath condominiums. Rates subject to change. Click "Book it Now" for rates and availability. Reservations for stays of 7 nights or less may be cancelled up to 18 days prior to your scheduled check-in date. Reservations for stays greater than 7 nights may be cancelled up to 30 days prior to the scheduled check-in date. If cancelled outside of these guidelines, the reservation is nonrefundable. All cancellations are subject to a $25 convenience fee.